Julia Commander is a third-year graduate student in the Winterthur/University of Delaware Program in Art Conservation. She is currently completing a curriculum internship at the Penn Museum. 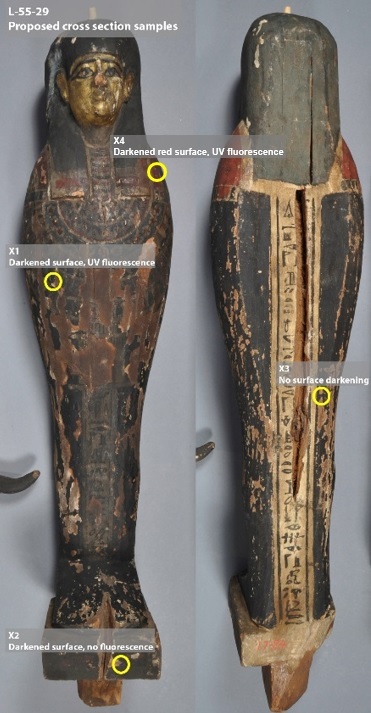 The investigation of the painted Ptah-Sokar-Osiris figure continues. Previously, I mentioned that I would be taking cross-section samples to gain a better understanding of the paint layers. This type of sampling involves taking tiny (less than 1 mm) flakes of paint to capture the stratigraphy. Once I have a slice showing all of the layers, I can look at the edge under magnification to observe the structure from surface down to ground level. In this case, I took four samples from representative areas on the figure in order to compare the layers. Before sampling, I looked at each area under magnification and made notes about surface characteristics and conditions. To sample, I continued working under magnification with a fresh scalpel blade. L-55-29, cross-section sample areas. You can also see the darkened appearance of the front surface. As you can probably imagine, handling a tiny little paint flake can be tricky. To make observation possible, conservators embed cross-section samples within a mounting material, typically a clear resin. 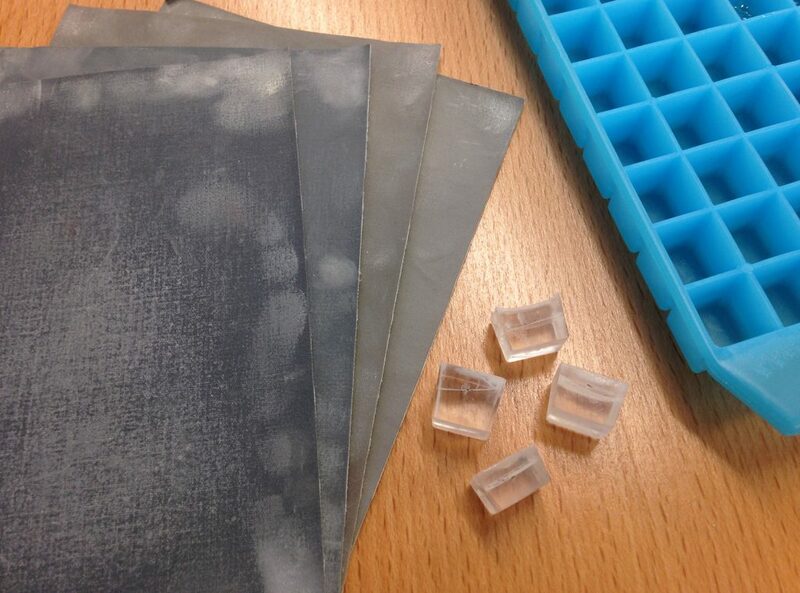 Mini ice cube trays are perfect for making small blocks of resin for this purpose. After embedding the sample between two resin pours, one face of the cube is polished to a glossy finish. The polishing process helps to get a clean cut of the sample from an edge-on perspective. Mounting cross-sections with a clear polyester resin, molded in a mini ice cube tray. The cubes are then polished with Micro-Mesh cushioned abrasive cloths. You never know exactly what your cross-section will end up looking like until it’s under the microscope. Flakes can shift while the resin cures or be affected by polishing, so it’s an exciting moment to see the results. Sample X2, below, shows a clear view of the layer structure. Similar to the way conservators use ultraviolet (UV) light during object examinations, cross-sections are often viewed with various light sources to show different properties. Here, you can see the sample in visible light and UV light (365 nm). Sample X2, 100X total magnification, in visible light (right) and ultraviolet light (left). Samples were viewed on a Zeiss Axio Scope.A1 polarized light microscope. We can see a few interesting features here. The sample area appeared to have predominantly red paint, although it was heavily obscured by the surface darkening. The uppermost layer of dark material could be related to a discrete layer of soiling or coating, or we could be seeing black paint. Since the front surface of the figure is intricately painted, it’s difficult to completely rule out paint as a possibility. Aged coating materials often fluoresce in UV light, which can help to distinguish them from underlying paint layers. In this case, we can see small flecks of fluorescence (indicated by the red arrows) but not a distinct fluorescent layer. We can also observe faint fluorescence in the ground layer, which is consistent with the idea of an aged animal glue binder. Another sample, X4, came from an area of plain red paint without any adjacent black designs. This area was also affected by the surface darkening issue, although to a less severe extent. Here, instead of a discrete layer of dark material, we can see small specks above the red paint layer (indicated by the red arrows). These dark specks are most likely related to soiling or discolored coating and unlikely to be original applied paint. Sample X4, 200X total magnification, visible light (right) and ultraviolet light (left). Samples were viewed on a Zeiss Axio Scope.A1 polarized light microscope. The cross-section samples offered some insights into the multi-layered nature of the delicately painted surface. As with most analytical techniques, results lead to more questions than clear-cut answers. Luckily, my colleagues here in the lab got together to talk about this complex condition issue and offer different perspectives and approaches. To clean or not to clean the darkened layer? Clarifying the surface details would be helpful for interpretation, but an even more gentle cleaning system will be needed to avoid damage to paint layers. The consensus: further testing needed!